One of the more powerful features of Subtext is the ability to generate random instances of storytelling that tie into the thematic intent of your premise. 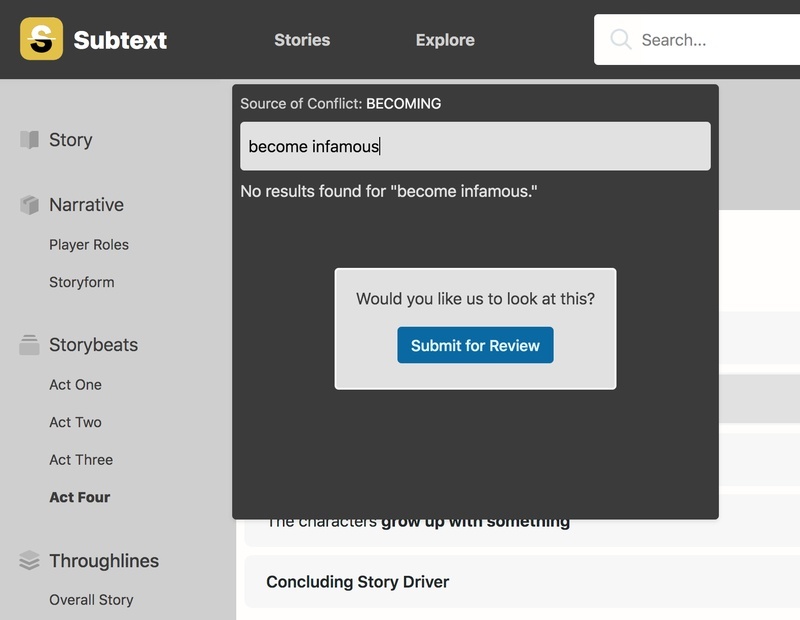 With access to a catalog of hundreds of thousands of example Storybeats, Subtext helps you fill in those missing spots in your story. Well, now that process has become even more insanely awesome. Introducing crowdsourcing for the generation of new Sources of Conflict in your stories. Now, when you search for an example that doesn’t exist in our extensive collection, you can submit a request for us to review your idea. Why a request, and not just a quick add to the cloud? It’s important for the integrity of the service and future development of narrative theory that the sample Sources of Conflict found within Subtext reflect the most accurate interpretation of key thematic elements. Our team of experts will review your idea, and if found correct, will add it to our permanent collection. We’ll even update that Storybeat you were working on for you with your new idea. And if it’s too specific, or too detailed to be useful to the masses, we’ll adjust it accordingly. In a way, you’re paying it forward by making it easier for future writers to benefit from your creativity. Everyone wins when we work together to develop a better and more comprehensive understanding of narrative structure. We know you’ll find this new feature exciting, and we look forward to hearing your requests!